In most areas of the country you'll find either an Antique Centre, Antique Shop or general Bric-a-Brac store. Indeed if you go somewhere on a Sunday in the summer you'll probably come across either an Antique Fair or Car Boot especially if it's a nice sunny day. 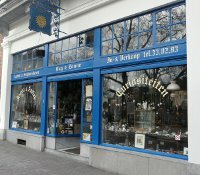 It seems too that even if you travel further afield into Europe you'll never be separated from shopping for Antiques. 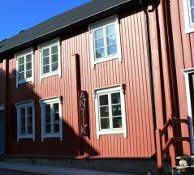 We recently received a couple of photographs of Antique shops spotted in Norway so thought we'd put a collage together of different Antique Stores from all over Europe that we've acquired from our own visits and those emailed in from other people! 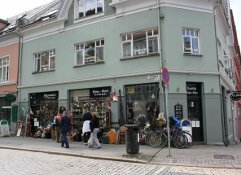 Photos 1&2: Two Antique Shops in Bergen, Norway; Photo3: An Antique Shop in Bruges, Belgium; Photo 4: Antique Shop in Roros, Norway; Photo 5: An Antique Shop in Meissen in Germany. 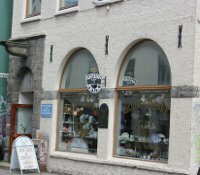 So, bear in mind next time you're on your travels if you see an interesting Antiques & Collectables shop, snap a photograph of it and send it too us - it might be featured in our next collage! We've recently added some interesting new pieces to the Perfect Pieces website including a very large and impressive shouldered Troika Rectangular vase decorated by Teo Bernatowitz and a very early Troika St Ives D-Plate. That's it for now. Remember, if you visit any good Antique Fairs this summer or spot any interesting Antique Shops or centres then be sure to let us know!